This weekend on Cult Movie Worship we're paying special attention to the lovely little films that were nominated for an Academy Award. They're all seriously beautiful films, but we're secretly pulling for live action time-traveling-blunder flick Time Freak. 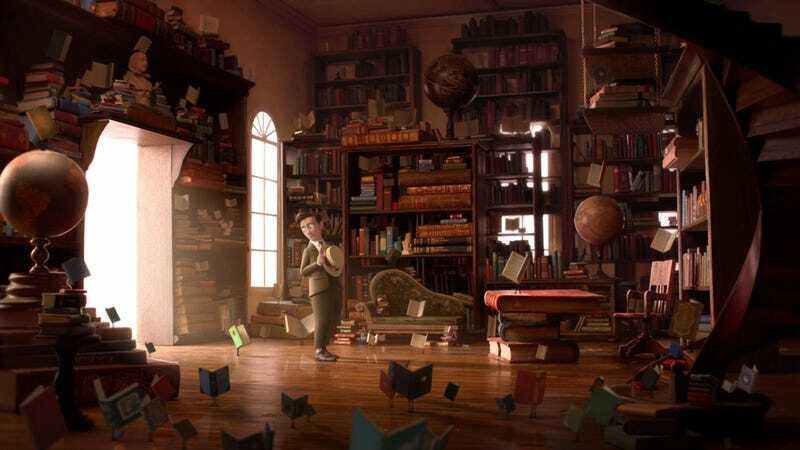 First up is the short by William Joyce and Brandon Oldenburg. Inspired by Hurricane Katrina and The Wizard of Oz, "Morris Lessmore is a story of people who devote their lives to books and books who return the favor." It feels like an elegant version of that old Macaulay Culkin movie, The Pagemaster. And as a bonus here's the reaction video from Time Freak creators Andrew Bowler and Gigi Causey. We dare you not to get a little watery eyed watching these two flip out. The secret behind the gorgeous Pixar short wraps around the mysterious employment these three sailors share. La Luna will be airing before Brave in theaters. And finally there's "Sunday" an animated film about how one magic trinket can change your entire world!